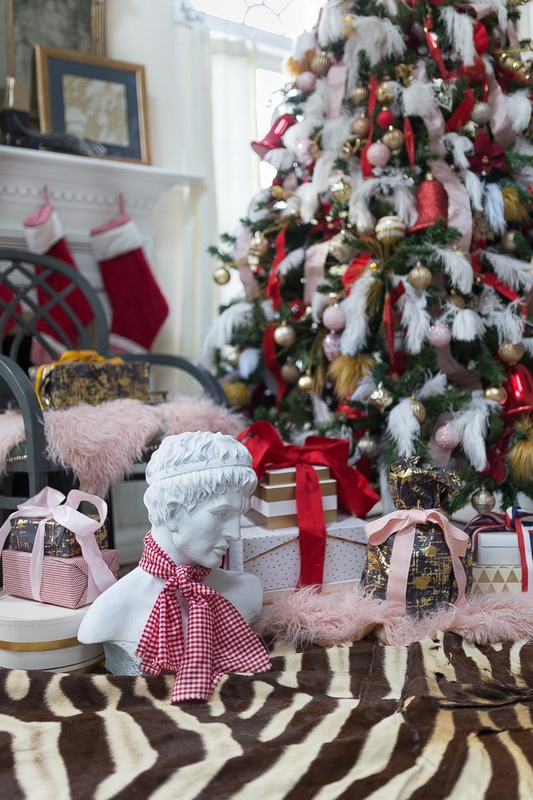 It’s begining to feel a lot like a Christmas Tree Blog hop, thanks to Stephanie form Casa Watkins Living. 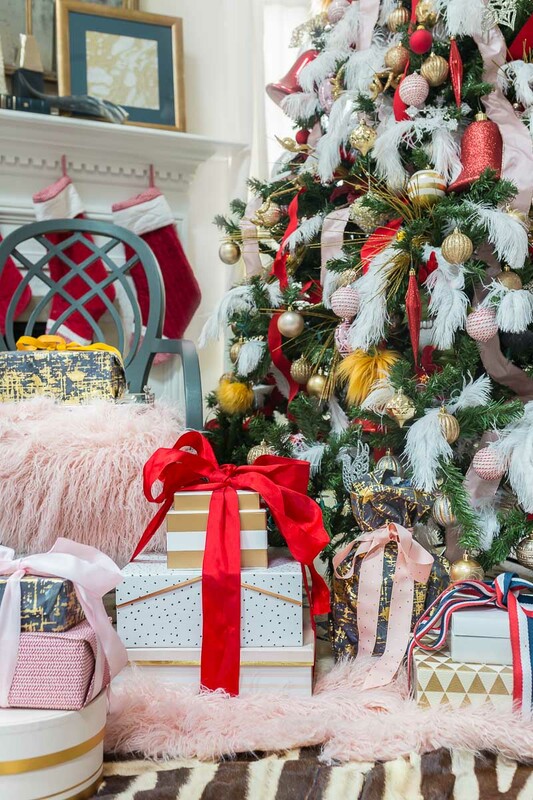 Stephanie, the queen of beautiful and globally inspired decor AND the current curator of a Tropical Boho Christmas tree, has put together a killer line-up of bloggers who are all ready to show off their trees! I’m excited for another round of My Home Style Blog Hop action! 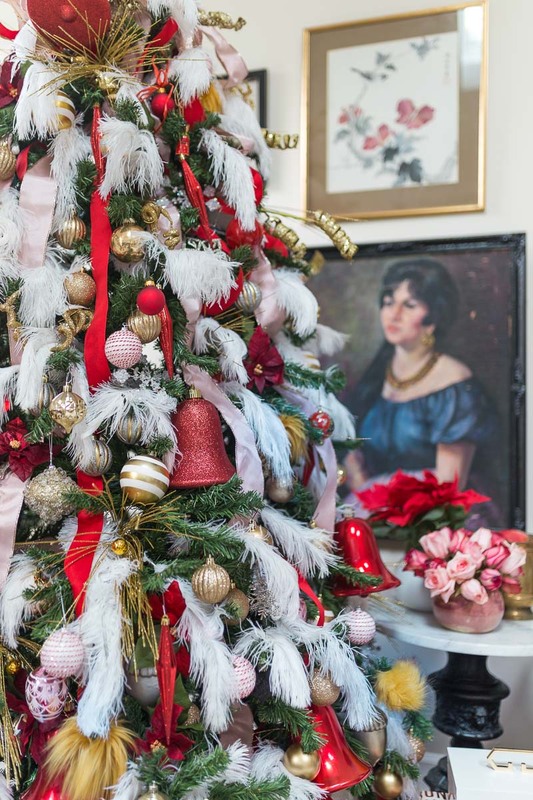 My guess is that you are likely joining me from Tag & Tibby and I can’t wait to go check out her Modern Flocked Christmas Tree. 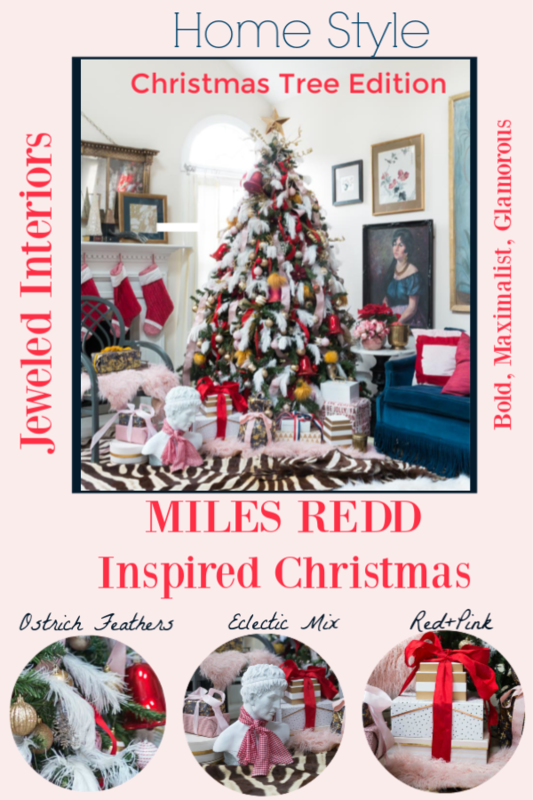 If you aren’t already familiar with Miles Redd then I would like to introduce you to one of my favorite designers of all times. 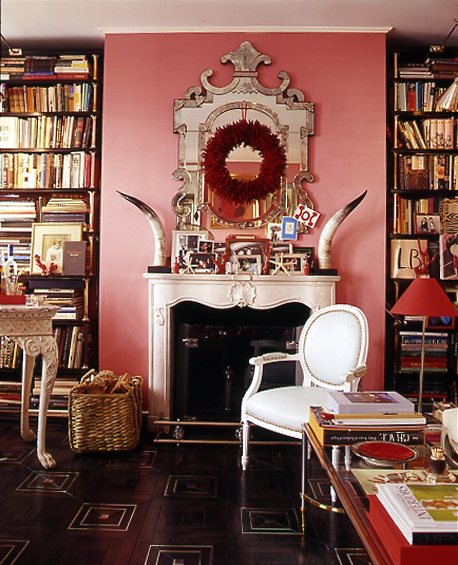 He’s bold and glamorous, he’s maximalistic, he loves color and pattern mixing, and he likes fringe on his sofas. So, um…yeah…I’m a big fan. What did I tell ya? He’s amazing right? 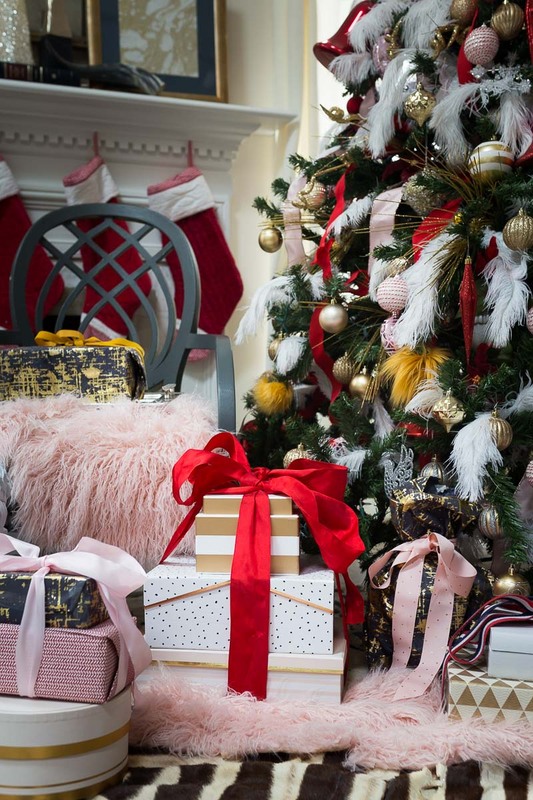 So, when I pulled out the Christmas bins this year, and draped my pink ribbons on my blue fringed-sofa a light bulb flicked on…. 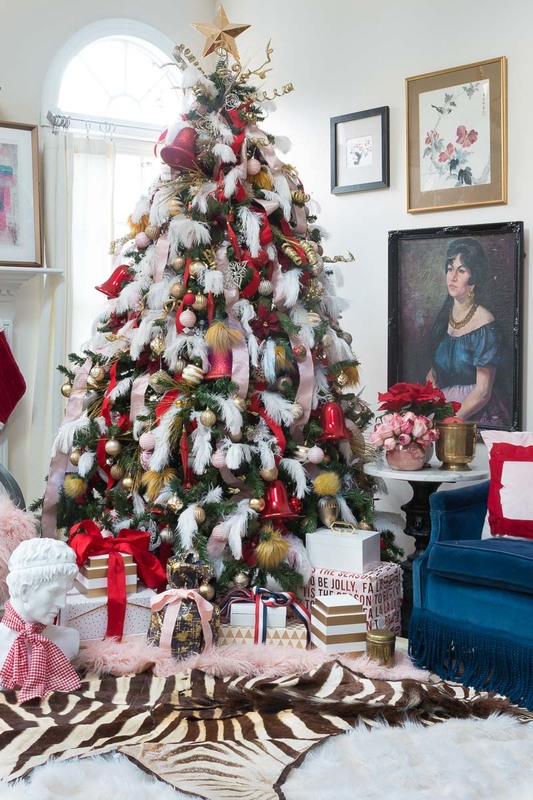 A Miles Redd Inspired Christmas Tree! YAAASSSSS!!! It took every ounce of restraint I had to not paint my entire living room pink, just for this event. Luckily for my husband I just didn’t have time. You will notice, however, that I DID employ a bold mix of pink and red…and no. That doesn’t clash…Despite what my 12 year old says . I pulled out the vintage zebra rug to emulate the iconic Miles Red zebra upholstered doors. If it’s a tribute to Miles, you obviously have to have fringe on your sofa and a maximalist pairing of eclectic art. Miles is a master of mixing patterns and textures. Ostrich feathers just seems like the right thing to do, doesn’t it? 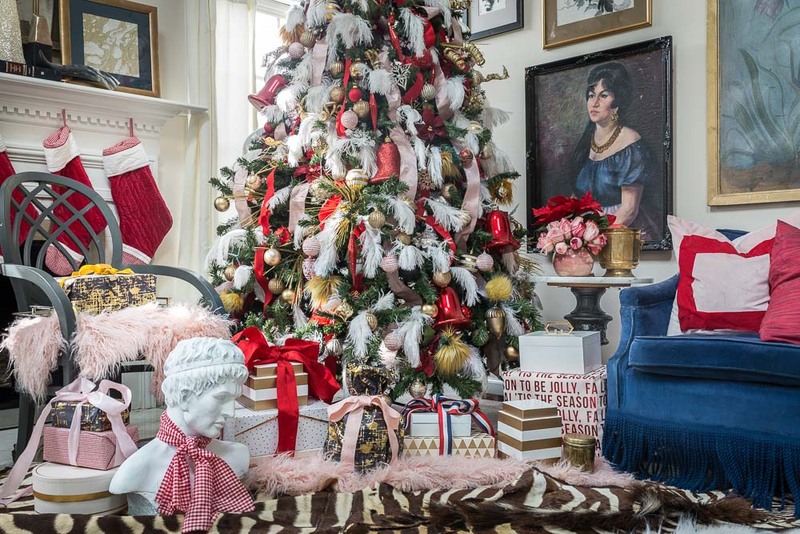 If there is one word to describe Miles Redd Style, I would pick Glamorous…Oh so Glamorous. See Carol, my friend in the oil painting? She may look judgy, but she secretly likes the tree too. At least she hasn’t told me otherwise. Now, if you have been watching my Instagram stories this week then you know that I just purchased this oh-so-serious new friend on Facebook Marketplace. I asked you folks to give him a name and now is the moment that I’m sure you’ve been waiting for…. Everyone, I’d like to introduce you to Tex! Tex, everyone…. Charmed, I’m sure. BTW TEX says “You’d better pin a picture….or else”. So from all of us at the Marlowe house (and especially from Ol’ Tex), we would like to wish you a fabulous Christmas and holiday season! 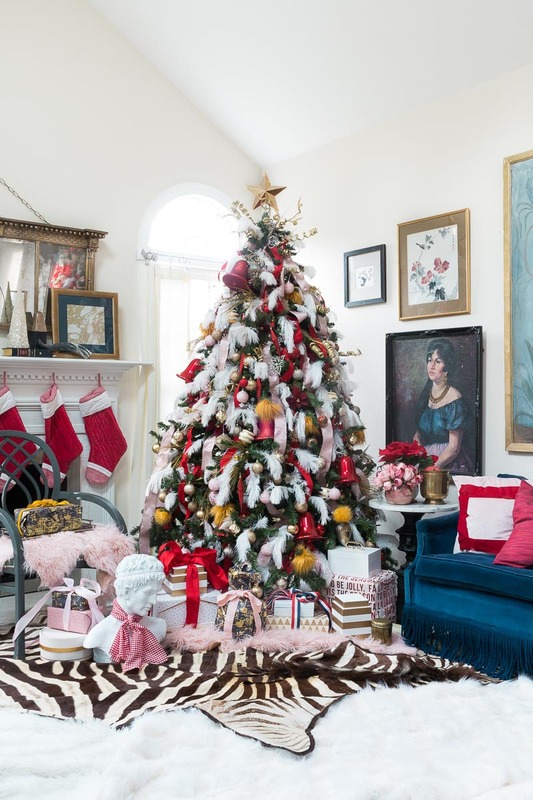 Ok…Now Check out the Fabulous tree decked out by Melanie from Sweet Savanna! Oh my goodness, this is just so, so good! I’m a big Miles Redd fan too, and I have to say, I think he’d be proud! Agreed on the pink and red too… When I was younger I thought they clashed, but now I realize what an excellent combo they are! Thank you so much! He’s such a good source for inspiration! 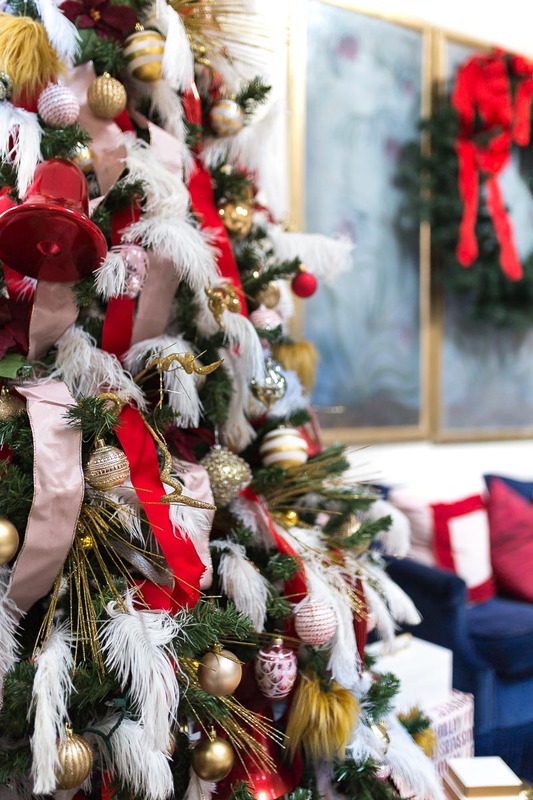 Your tree is stunning! 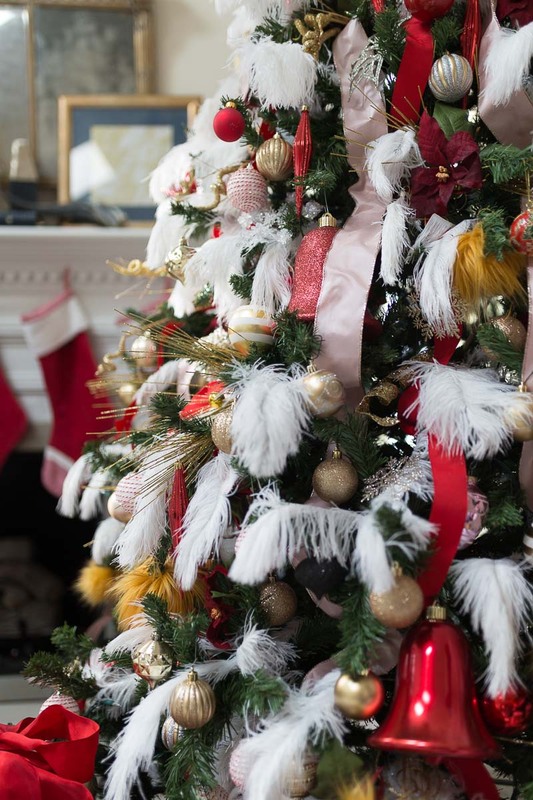 I especially love the ostrich feathers-they add so much texture! Thanks so much Julia! Loved seeing your tree too! Such a stunning Christmas display. Even Miles Redd would be floored. 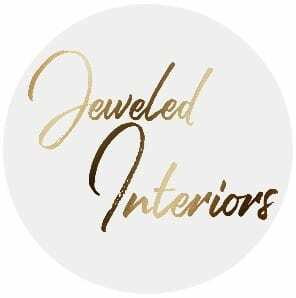 It’s beautiful, Jewel! And so happy to make Tex’s acquaintance. I love the feathers! How fun! And as a side note, your blue sofa is FABULOUS. This is an incredible tree, Jewel! So unique! I don’t think I’ve ever seen a tree done quite like this! Gorgeous ornaments. Wow, you knocked it out of the park! This is one of the most amazing trees I have ever seen! 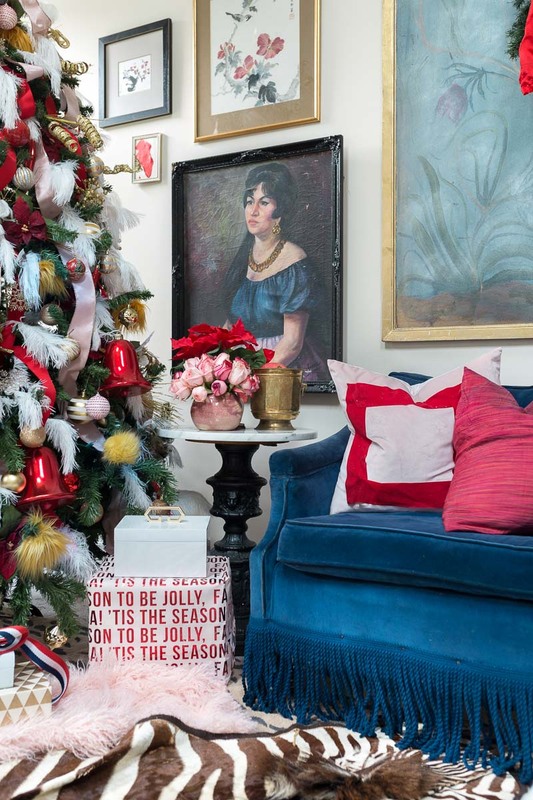 It’s incredible and so Miles Redd! Love it! 😂 Oh my Goodness Linda. This is so kind! Thank you so much. You tree was stunning too! Absolutely gorgeous and so many details to take in. 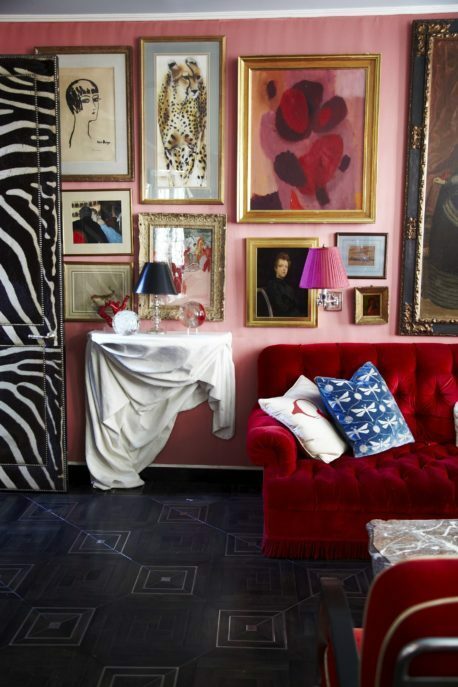 Love the feathers, animal print, and pink and red! And Tex. 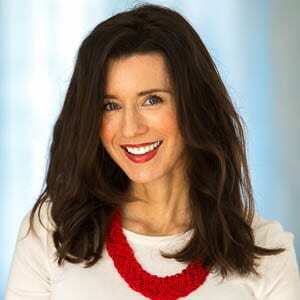 You already know this – and I may be commenting a second time (who knows?!) – but I just LOVE this tree.